Samsung is all set to unveil its Galaxy Note 8 later this month in New York City. new leak via Android Headlines claims to show every colour Samsung is planning. The leaked image shows that the company will be making it available in a variety of different colors, The image shows the Galaxy Note 8 in whopping 8 color options. 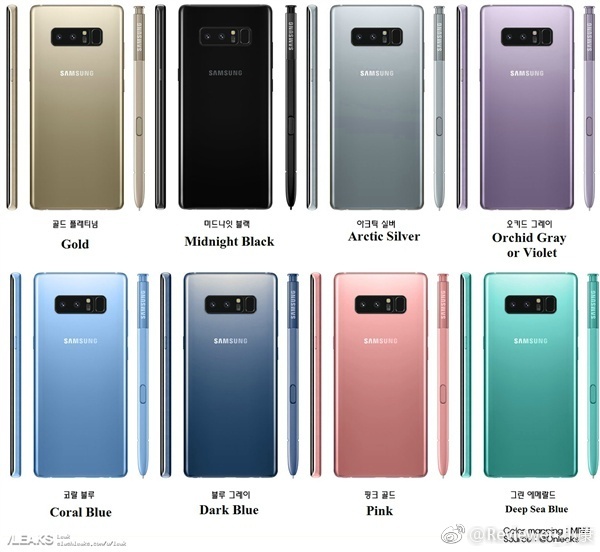 The Galaxy Note 8 will launch in Midnight Black, Arctic Silver, Orchid Gray/Violet, Coral Blue, Dark Blue, Deep Sea Blue, Pink, and Gold. Previous rumours suggest that the Samsung Galaxy Note 8 may sport a 6.3-inch QHD (1440x2960 pixels) Display, It is expected to be powered Snapdragon 835 and Exynos 8895 SoC variants, and it is expected to utilize 6GB of RAM.